It's really only appropriate that Mr. Softee makes an appearance on this blog at some point. We have a bit of a love hate relationship, and often times when I spot the truck I have to stop for a cone, but overall I'm pretty happy I live in a city where it exists. Anyways, I have been totally into head wraps like this lately to tame my hair on humid and muggy days. Much more breezy than a hat, yet does the same trick. And it also reminds me of Rosie the Riviter, which is always a plus in my book. Happy Friday! Hope it's a good one. And you know I interviewed the woman who was the model for Rosie the Riveter - just an incredible woman! Gorgeous lady! Love the head wrap idea! Your photos have such a beautiful, dreamy quality, which makes your outfit even more amazing! Love this. :) really beautiful photos. Oh your style is so perfect and your photographs are really beautiful as well! Love the effect of these pictures! I like color of your lipstick! Such a cute, retro chic look! Gorgeous photos, ilove the retro style! Beautiful dress too! You look so boho chic! I love your hairband and sunnies! I love everything about this look Bonnie! Very cool outfit! Love your dress! Love the head wrap and the bracelets! Very cute! great outfit! love your hair & make up too! Amazing Bonnie!! LOVE the lace dress with the denim jacket!! I love absolutely everything about this look! stunning look! and i love that first photo. looks like a vintage style polaroid shot. I love the photos, especially the second to last one! Great look, you really suit the headband! Oh my goodness, I am in love with your outfit and how you tied your jacket around your waist. I have not done that since middle school. I thought it was probably the coolest thing to do. I should relive my childhood and do it again sometime, haha! So fun and vintage! 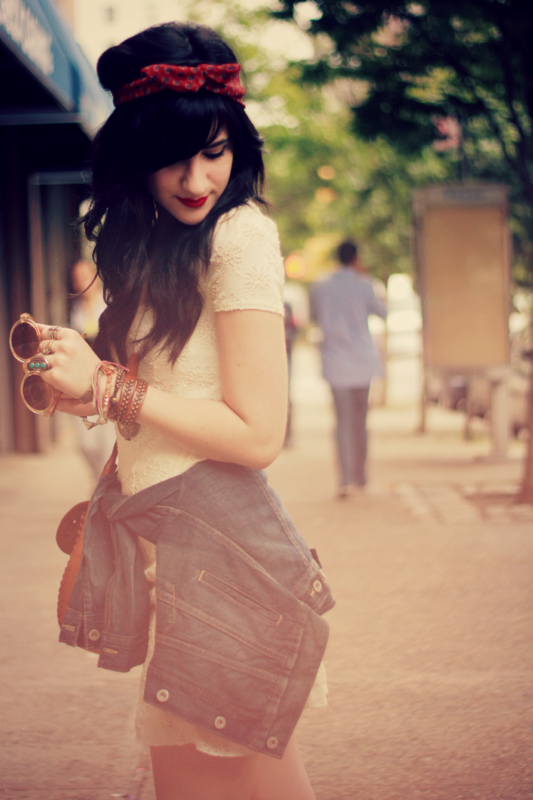 The denim jacket looks perfect tied around the waist. I never considered doing that but it's somewhat genius. So cute with the head wrap too! 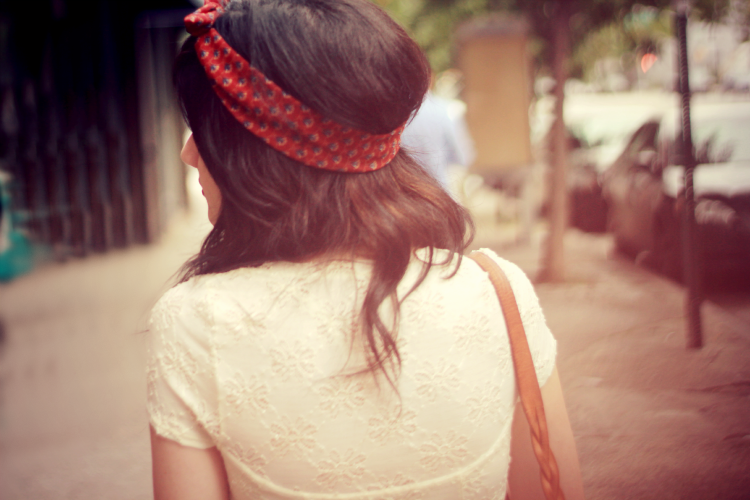 Love this post, your hair looks lovely with the band in it and love the styling, something retro/vintage about it! Beautiful! I love the dreamy style of these photos and your lipstick. Could you do a make-up tutorial? You always look flawless! Have a good weekend pretty gal! you look very cute with that headband! So cute! I love your dress and head band! you look like a cute 90's girl in this outfit. can't wait to see another pictures of yours wearing some cute head wraps and red lipstick. stunning!! So cute, love the Rosie-inspired look! Super cool shots. Love your outfit. Awesome retro shades. Love my outfit! But I don't know if I can pull it off like you do! The headband is super cute. Love this look! You look lovely wearing your headwrap and sporting red lips! I love this outfit, and your headwrap is so cool! You look beautiful! You look amazing as usual! I really like the denim jacket tied around your waist, there's some 90's revival in there and I love it! What a gorgeous style and loved it. i will follow on face book also. Soon this style will come back. so gorgeous. absolutely amazing style. I'm really like the whole outfit. Cute. Love your head wrap. You look really cute as "rosie" and have a mr. softee for me... I miss them! -JB.